Board games and tabletop games have evolved so far beyond the classics like Monopoly and Life - now providing a plethora of experiences from quick, ten-minute long games to lengthy strategy adventures with various, carefully structured areas of play to consider. There are also dozens of video game adaptations, and games which require a mobile phone to play! Board games are a great way to socialise with friends, and can often be combined with [insert your drink of choice here] to create a brilliant evening of entertainment. Once seen as slightly nerdy, there's no longer a stigma around board games, card games, or tabletop gaming, so it's a great option to have ready for a party or family gathering. But with so many options and loads of different games to consider, you might be wondering where to even start. Hopefully, I can address some of that today. And if you're looking for more recommendations, here are the best board games you can play in 2018. What are modern board games and tabletop games like? Modern tabletop games come in a variety of shapes and sizes - and that's not just talking about the boxes they come in. Like video games, there is a huge amount of variety out there. Much like the classics, each game has a set up period where you get all of their components in place - and all of them come with instruction books. New games are being released each day, so you're almost guaranteed to find something you like; battling through dungeons in Dungeons and Dragons the board game, playing with robots in Stakbots, or physically stacking up cards in Rhino Hero, are just some of the things you can do whilst playing board games.. Unlike digital games, board games normally require you to play around a table with your friends (although there are some single-player and two-player board games out there). Some take up a large amount of space while others can be played on side tables. Most can be played on the floor, if you're short of table space. Just be kind and supply cushions. It’s never been easier to get into board games either. Most major cities in North America and Europe have a hobby stores and GamesWorkshops, there are major conventions every other month like Gen Con or Spiel Essen, and the internet is, naturally, right at your fingertips. There are several major online, specialist storefronts, a quick google will find you a dozen or so with minimal effort. I tend to buy games directly from publishers like Daily Magic who consistently make games in a style I like, or from places like Amazon and ThinkGeek. How do I get friends or strangers to play? If you start looking up board gaming in your area, you will probably find some board game groups that you can join - if you are London Based, Tabletop Tuesday at the Loading Bar is very welcoming. Many smaller, physical tabletop game shops can point you in the direction of more events to attend - and quite a few of them even host game nights themselves. The best tactic is to just ask at the nearest store, especially if you're not based in a big city. You can ask your friends if they’d be interested in playing, much like you would ask them to hang out. Having a few people over at your house for a start is a good way to arrange a board game night. If you like the games, it can become a regular thing. There’s an increasing cross-over between video games and board games, and so you may well find that a few friend-of-friends are already having regular sessions. If all else fails, or if you’d like to know more about board games from an online group of people, BoardGameGeek have a lovely forums area full of people talking about them! You could even find a bunch of players in your area to hook up with. Is it an expensive hobby? 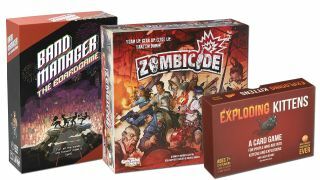 Physical tabletop games range from $20 like Exploding Kittens, to $80+ like CMON Zombicide Black Plague - so it is really up to you. If you are looking for smaller tabletop games, you can pick up a variety of lightweight card games for less. If you are looking to collect a few staple games that you can have around for parties and enjoy with a few friends - it just costs however much you want to spend. If you are more of a collector, you might find that you enjoy wargames - which have hundreds of little figures and armies that can be collected and painted - like WarMachine (a strategic fantasy wargame), Bolt Action (a World War 2 tabletop game), and Infinity (sci-fi models, fighting it out). Many games also have expansion packs come out - with more pieces and more cards to create more content for their game like RuneWars with its miniature expansions. If you are interested in obtaining all of these extra expansions, it can cost more to you - but it really is however much you’re willing to put into your collection. You can definitely start out small, only getting what you feel you might like. In addition to this, there are programs like Tabletopia or Tabletop Simulator which you can use to try out games before you commit to buying them. This is before the fact that there are dozens of print-and-play board games available for free through itch.io. What are the best ones for beginners? Tabletop games all have some information on the box to help tell you how difficult the game is going to be. There are age ratings as well as how long the game takes and how many players are needed. This is helpful when it comes to seeing how difficult it would be for a younger audience or for people not looking to take that much time to learn how to play a game. Games like Colour Chess + Lure take a classic (Chess) and expand it to be a more fun and new age game. Steve Jackson’s Munchkin series is a staple - as it is an easy game to get into and does well when it comes to being light on rules and set up. Takenoko is an adorable and easy to play board game that even has you building up sections of bamboo. Card games like Tiny Swords, Fluxx, or Gloom are also a really good start - there are a huge variety of them and all of them are very light weight when it comes to setting up and playing. In general, the fewer components a board game has, the less complicated the set up and play stages of the game are. What are the best ones to graduate to from beginner? Once you’ve found a few games which you really enjoy playing, it is worth seeking out a recommendation for more advanced takes on the game. Barker’s Row is good as a heavy weight card game, Band Manager: The Board Game is a lovely and unique game played on a t-shirt, and Mansion of Madness is a mystery shrouded horror game where you are exploring an old, haunted house. Alternately, there are plenty of online communities focused around board games which can recommend similar games. There’s definitely some merit in becoming familiar with a few favourite games and returning to re-read the rulebook before moving onto another title. This is because, unlike video games which have their own tutorials, many board games lack guides for the early stages - which can be a deterrent to the less committed. Do people stream their plays, and can I watch now? Not only do people stream playing board games, but many people stream the rule books, like Watch It Played, that go along with these games. Streaming board games really helps you get an idea of how the game should be played, how people are reacting to it, and if it is the type of game for you. Shut Up & Sit Down does a lot of reviews and looks into board games in a video format, for example. Sometimes you simply can’t figure out if it is a good fit for what you want based on the box. You can find tons of videos on Youtube as well as some streamers on Twitch. Watching people explain and demonstrate the rules to board games can be helpful when you are just starting out - as it is much easier to see what needs to be done instead of trying to read it. Hopefully that helps you get started in exploring physical games and joining the ever growing world of tabletop. Personally, I started picking games that were super cute looking board games and figuring out what style I really enjoyed. You might even find a friend that has board games around for you to check out.